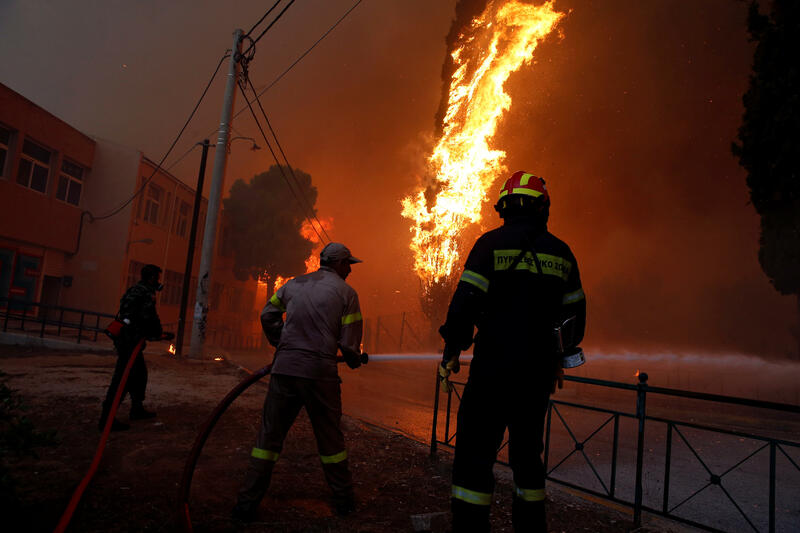 ATHENS, Greece -- Gale-fanned wildfires raged through holiday resorts near Greece's capital, killing at least 24 people by early Tuesday and injuring more than 100, including 11 in serious condition. This is the country's deadliest fire season in more than a decade as it torched cars, charred farms and forests, and sent hundreds of people racing to beaches to be evacuated by navy vessels, yachts and fishing boats. Fire Service spokeswoman Stavroula Malliri said Greece had called on the European Union for aerial support and personnel to help battle the flames. BBC News reports countries including Italy, Germany, Poland and France have sent planes, vehicles and firefighters. At daybreak Tuesday, the coast guard says four bodies -- three women and a child -- were found in the sea near the wildfires. Ambulance Service deputy director Miltiadis Mylonas said the number of casualties was likely to rise as the more gutted homes and cars were checked. He says, "It took people by surprise and the events happened very fast." A witness told Reuters some of the victims were fleeing in cars or on foot when the flames approached. At least four charred bodies were were seen on a road in the community of Mati, about 18 miles east of Athens. That area was devastated by the fast-moving blaze that started around 5 p.m. local time Monday. Reuters says that one victim was in a car, another beneath a vehicle. Two people died on a motor bike in what appeared to be a traffic jam heading to a safer area at a nearby beach. Winds reached 80 kph (50 mph) as authorities deployed the country's entire fleet of water-dropping planes and helicopters to give vacationers time to escape. Military drones remained in the air in the high winds to help officials direct more than 600 firefighters on the ground. The dock area became a makeshift hospital as paramedics checked survivors when they came off coast guard vessels and private boats. The operation continued through the night. "The task we face now is organizing the identification of victims by members of their families," Mylonas said. The fire posed no immediate threat to Greece's famed ancient monuments, but as it raged inland where children's' summer camps and holiday homes were hastily abandoned. Fleeing drivers clogged highways into the capital, hampering the firefighting effort, and flecks of ash swirled onto central Athens. It was the deadliest fire season to hit Greece in more than a decade. More than 60 people were killed in 2007 when huge fires swept across the southern Peloponnese region. "It's a difficult night for Greece," Prime Minister Alexis Tsipras said after flying back to Athens from a trip to Bosnia that was cut short. Authorities said Cyprus and Spain offered assistance after the request for EU help was made. Greek Fire Service officials issued public pleas for residents in fire-affected areas to comply with evacuation orders and not stay on in an effort trying to save their homes. Rafina's mayor said he believed about 100 houses in that area had burned. The fire service was not able to confirm the figure. Showers that passed over the Greek capital Monday missed the two big fires - one at Rafina, 30 kilometers (18 miles) to the east, and the other at Kineta, 55 kilometers (35 miles) to the west. Heavy rain is forecast across southern Greece on Wednesday. Forest fires are common in Greece during the hot, dry summers, and temperatures recently hit highs up to 40 degrees Celsius (104 Fahrenheit).